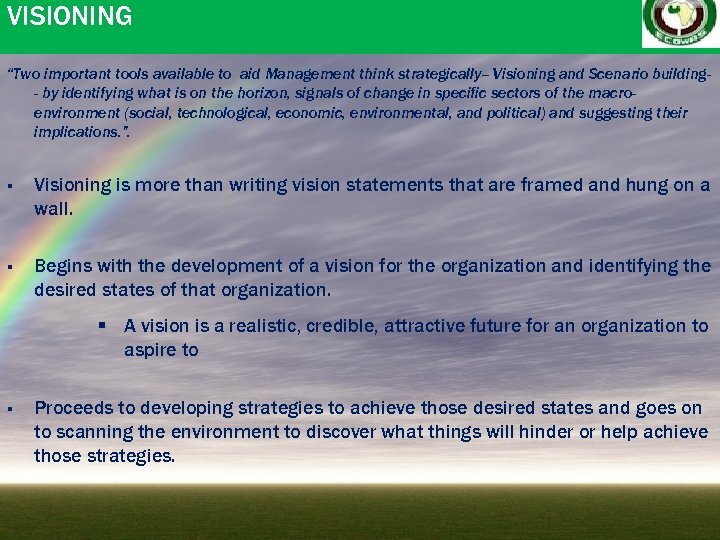 VISIONING “Two important tools available to aid Management think strategically-- Visioning and Scenario building- by identifying what is on the horizon, signals of change in specific sectors of the macroenvironment (social, technological, economic, environmental, and political) and suggesting their implications. ”. 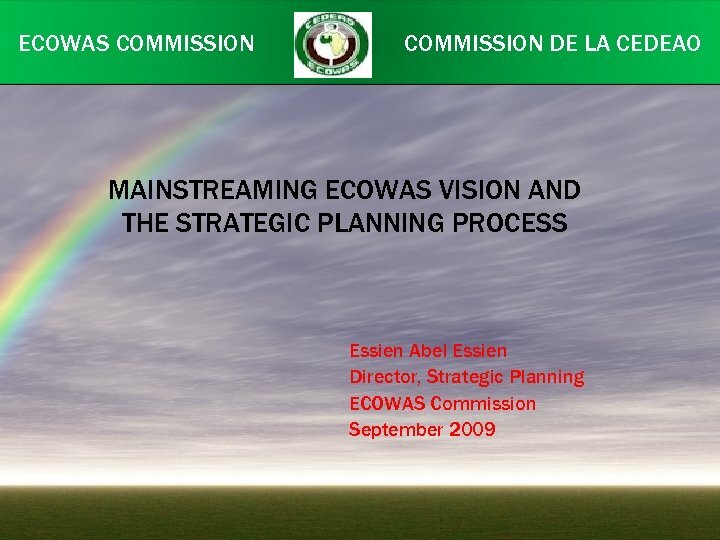 § Visioning is more than writing vision statements that are framed and hung on a wall. 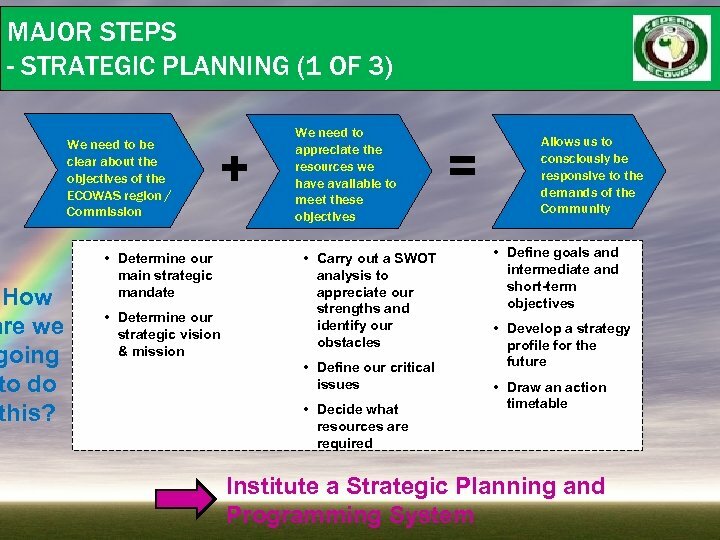 § Begins with the development of a vision for the organization and identifying the desired states of that organization. 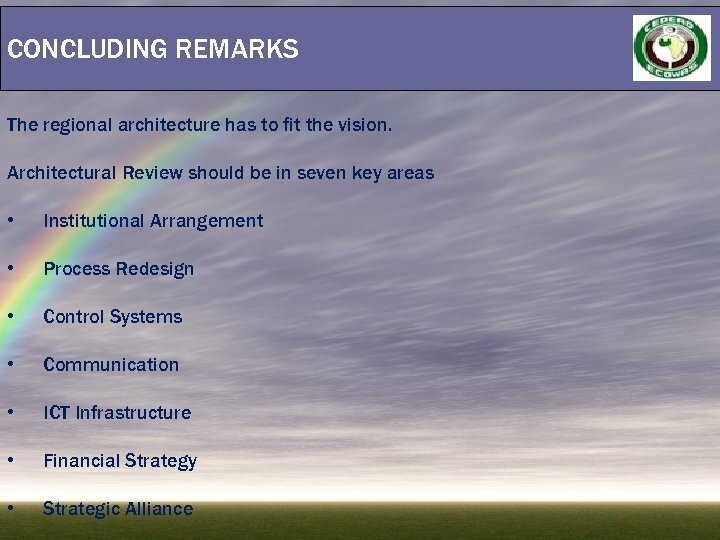 § A vision is a realistic, credible, attractive future for an organization to aspire to § Proceeds to developing strategies to achieve those desired states and goes on to scanning the environment to discover what things will hinder or help achieve those strategies. 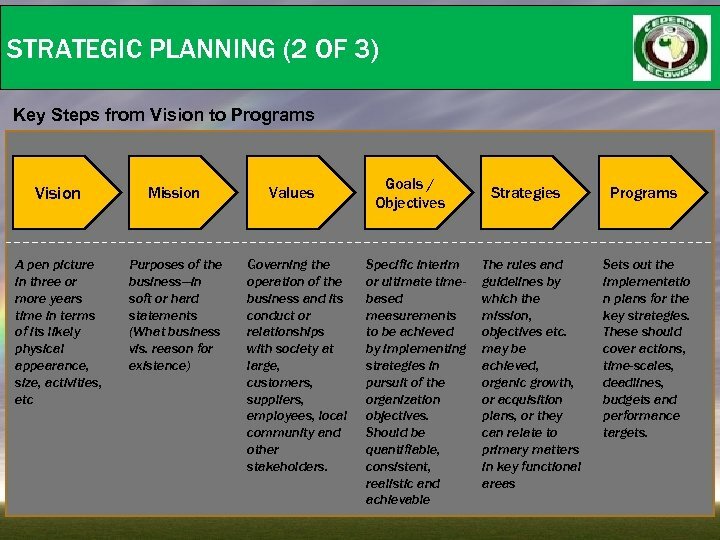 STRATEGIC PLANNING (2 OF 3) Key Steps from Vision to Programs Vision Mission A pen picture in three or more years time in terms of its likely physical appearance, size, activities, etc Purposes of the business—in soft or hard statements (What business vis. 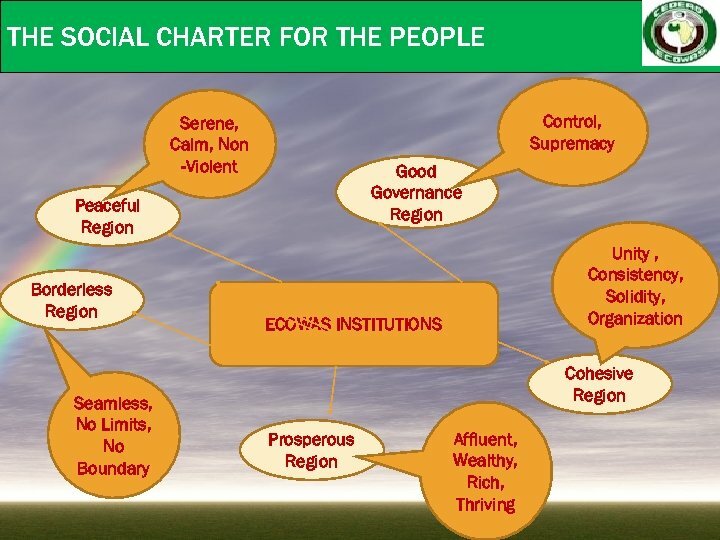 reason for existence) Values Governing the operation of the business and its conduct or relationships with society at large, customers, suppliers, employees, local community and other stakeholders. 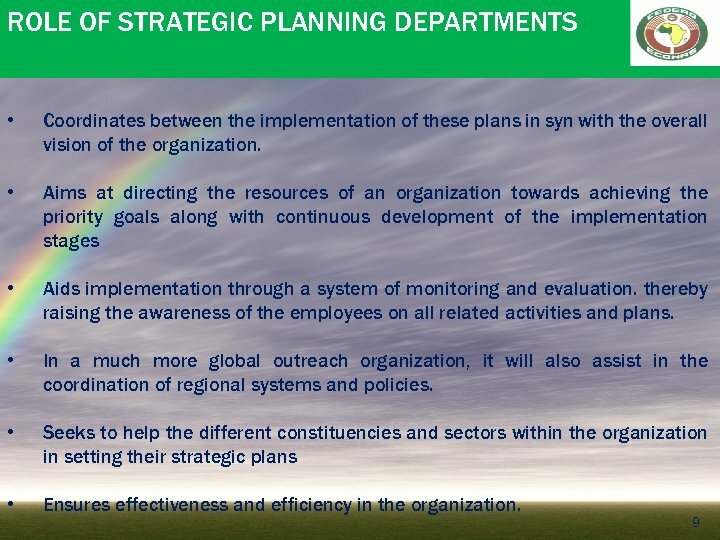 Goals / Objectives Specific interim or ultimate timebased measurements to be achieved by implementing strategies in pursuit of the organization objectives. 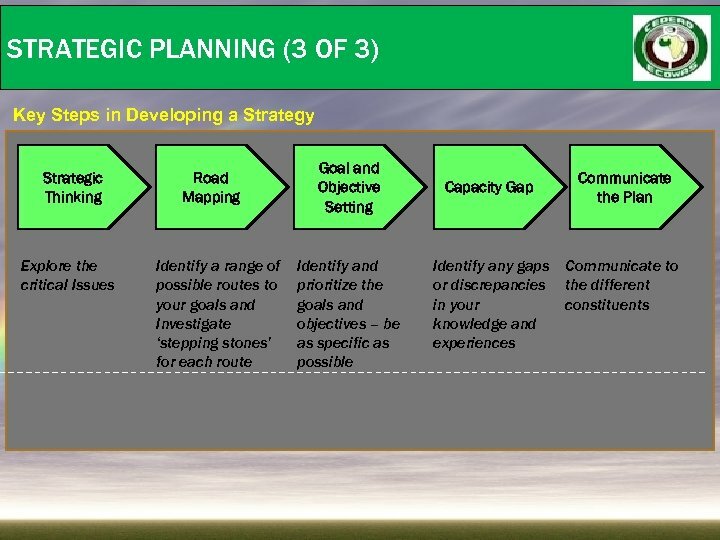 Should be quantifiable, consistent, realistic and achievable Strategies The rules and guidelines by which the mission, objectives etc. 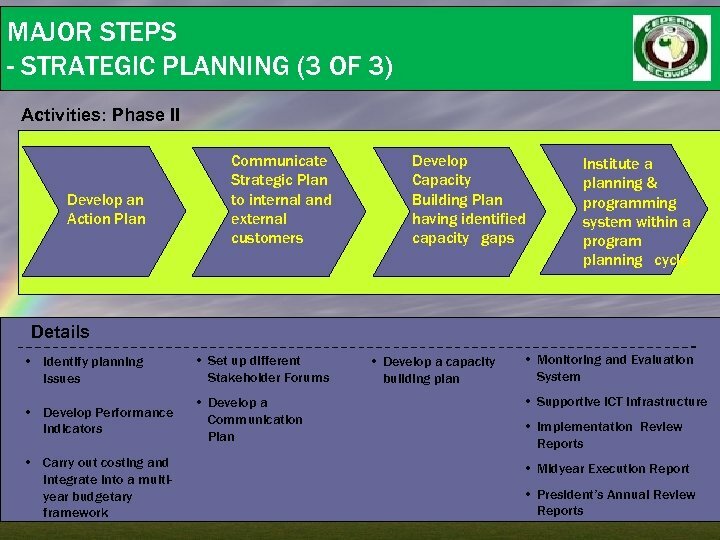 may be achieved, organic growth, or acquisition plans, or they can relate to primary matters in key functional areas Programs Sets out the implementatio n plans for the key strategies. 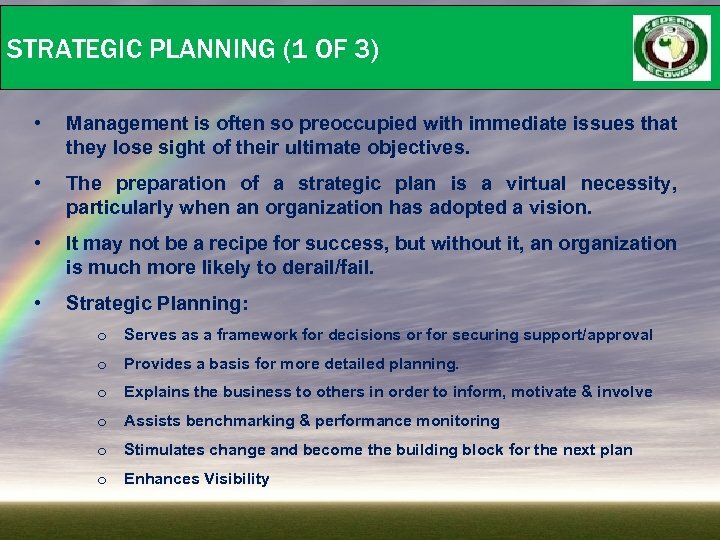 These should cover actions, time-scales, deadlines, budgets and performance targets. 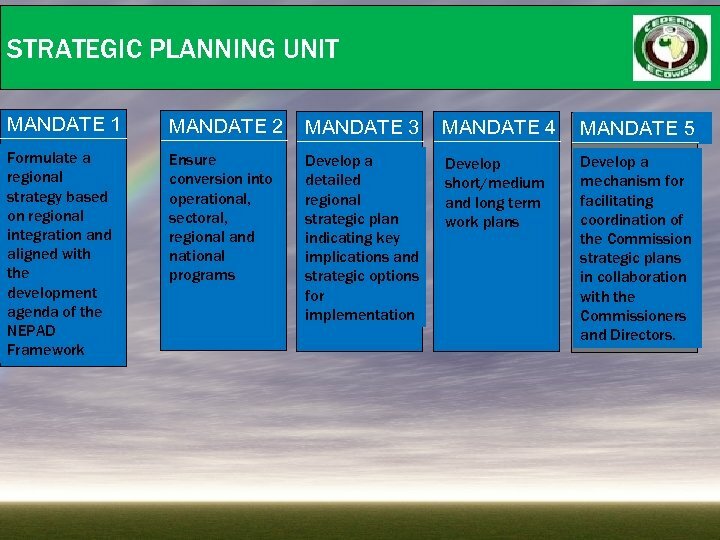 STRATEGIC PLANNING UNIT MANDATE 1 MANDATE 2 MANDATE 3 MANDATE 4 MANDATE 5 Formulate a regional strategy based on regional integration and aligned with the development agenda of the NEPAD Framework Ensure conversion into operational, sectoral, regional and national programs Develop a detailed regional strategic plan indicating key implications and strategic options for implementation Develop short/medium and long term work plans Develop a mechanism for facilitating coordination of the Commission strategic plans in collaboration with the Commissioners and Directors. 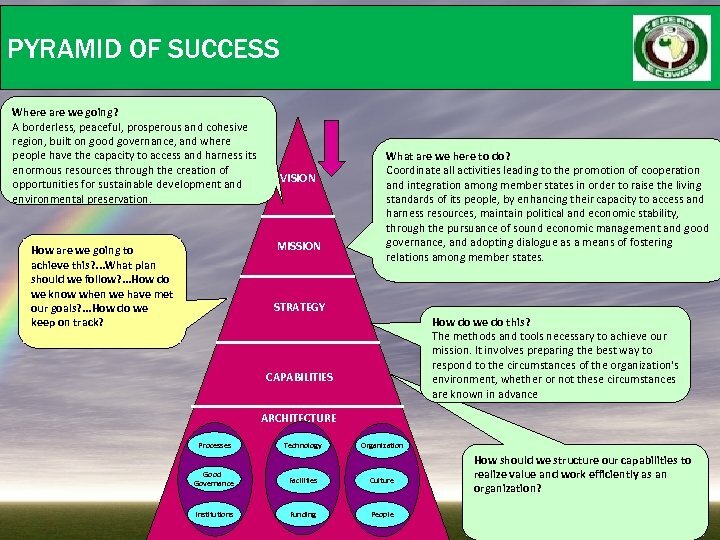 PYRAMID OF SUCCESS Where are we going? 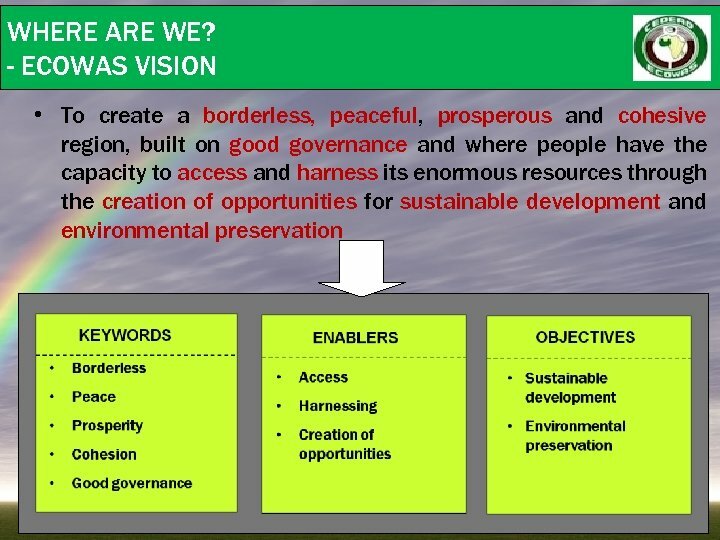 A borderless, peaceful, prosperous and cohesive region, built on good governance, and where people have the capacity to access and harness its enormous resources through the creation of opportunities for sustainable development and environmental preservation. 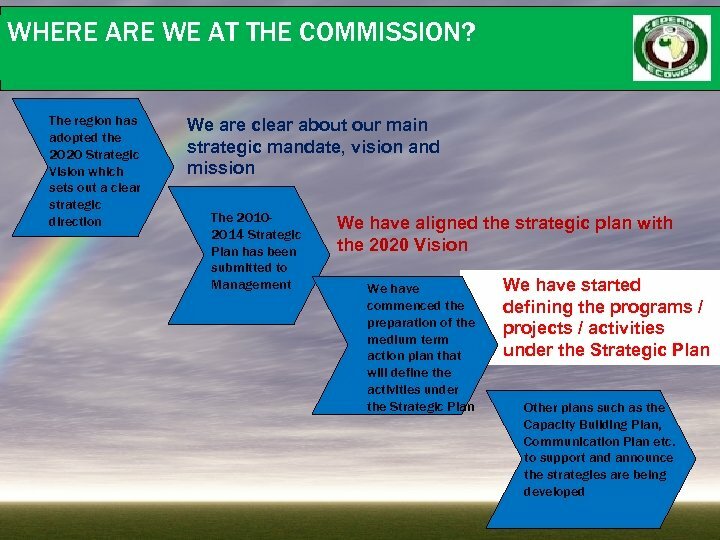 VISION MISSION How are we going to achieve this? . . . What plan should we follow? . . . How do we know when we have met our goals? . . . How do we keep on track? What are we here to do? 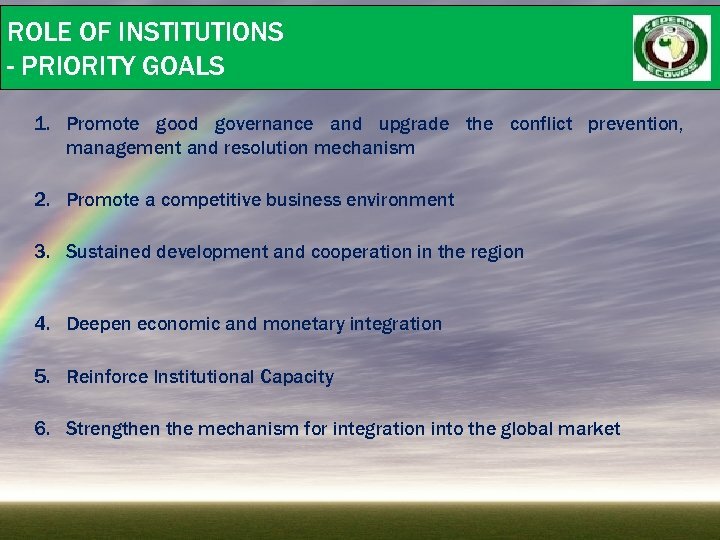 Coordinate all activities leading to the promotion of cooperation and integration among member states in order to raise the living standards of its people, by enhancing their capacity to access and harness resources, maintain political and economic stability, through the pursuance of sound economic management and good governance, and adopting dialogue as a means of fostering relations among member states. 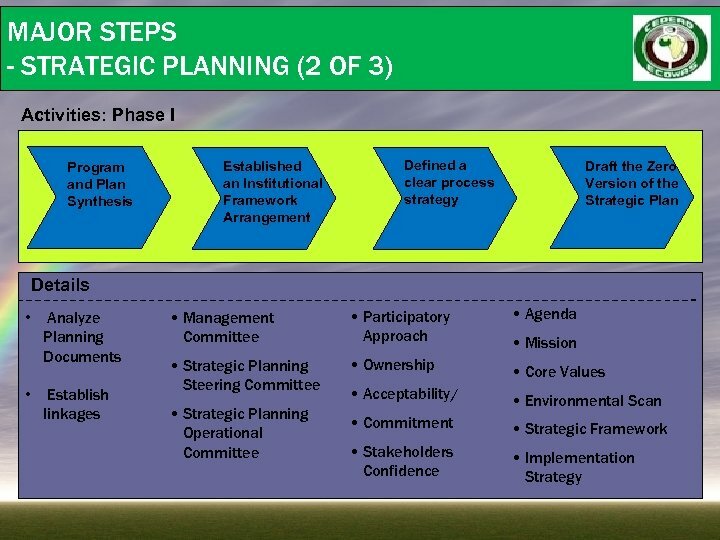 STRATEGY How do we do this? The methods and tools necessary to achieve our mission. It involves preparing the best way to respond to the circumstances of the organization's environment, whether or not these circumstances are known in advance CAPABILITIES ARCHITECTURE Processes Good Governance Institutions Technology Organization Facilities Culture Funding People How should we structure our capabilities to realize value and work efficiently as an organization? 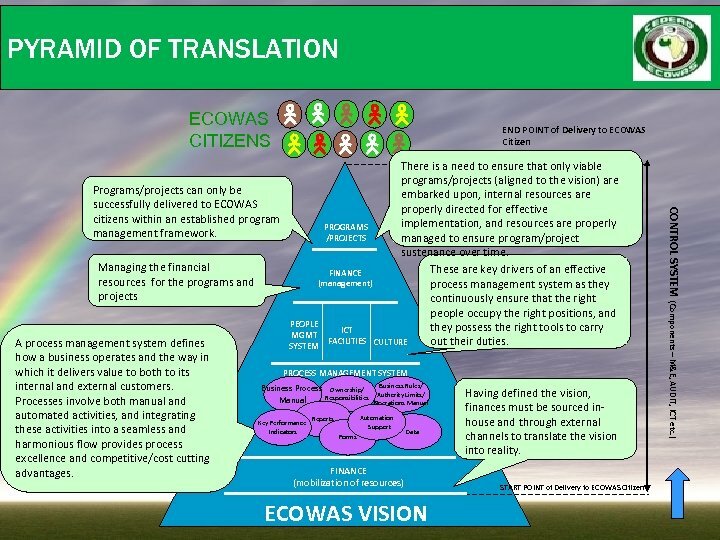 PYRAMID OF TRANSLATION ECOWAS CITIZENS END POINT of Delivery to ECOWAS Citizen (mobilization of resources) ECOWAS VISION START POINT of Delivery to ECOWAS Citizen CONTROL SYSTEM (Components – M&E, AUDIT, ICT etc. ) There is a need to ensure that only viable programs/projects (aligned to the vision) are Programs/projects can only be embarked upon, internal resources are successfully delivered to ECOWAS properly directed for effective citizens within an established program implementation, and resources are properly PROGRAMS management framework. 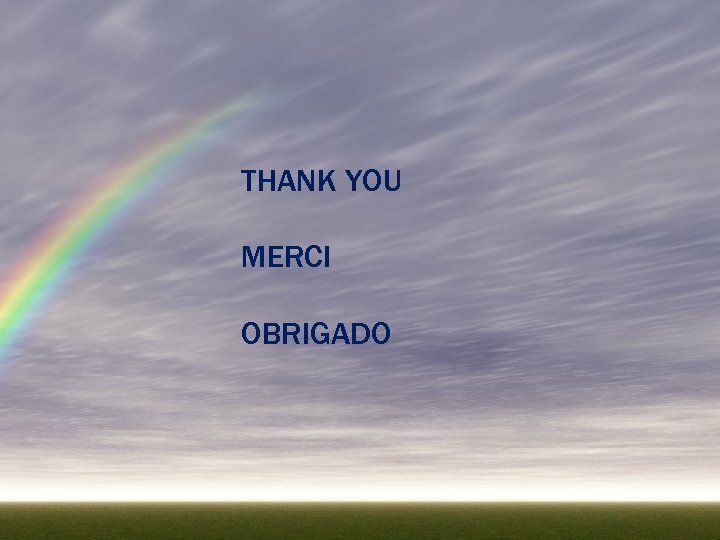 /PROJECTS managed to ensure program/project sustenance over time. Managing the financial These are key drivers of an effective FINANCE resources for the programs and (management) process management system as they projects continuously ensure that the right people occupy the right positions, and PEOPLE they possess the right tools to carry ICT MGMT FACILITIES CULTURE out their duties. A process management system defines SYSTEM how a business operates and the way in PROCESS MANAGEMENT SYSTEM which it delivers value to both to its Business Rules/ internal and external customers. Business Process Ownership/ Authority Limits/ Having defined the vision, Responsibilities Manual Processes involve both manual and Operations Manual finances must be sourced inautomated activities, and integrating Automation Reports Key Performance house and through external Support these activities into a seamless and Indicators Data Forms channels to translate the vision harmonious flow provides process into reality. excellence and competitive/cost cutting FINANCE advantages. MOTIVATION MOTIVATION 1. What is motivation? 2.